﻿ 2xKONIS-T – KONČAR Elektronika i informatika d.d. DC power supply system 2xKONIS-T consists of two completely independent power supply systems KONIS-T, configured in a redundant parallel system. The system KONIS-T is a complete system including distribution boards and batteries, based on rectifier KONIS T-220, which controls the whole system. 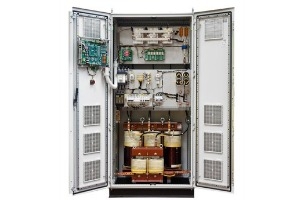 Rectifier KONIS-T 220 is designed to supply with 220 V specific DC loads in the energy and industrial plants, and for charging and float charging of stationary batteries. Rectifier KONIS T-220 is designed as a simple source of stable DC voltage, and can be applied as a vital component of the system for uninterruptible power supply of specific DC loads whose reliable operation is of particular importance. In addition to loads supply, rectifier provides automatic charging and re-charging of the connected battery by precise DC voltage without ripple. The base of the rectifier makes a robust and very reliable three-phase thyristor bridge for full-wave rectifying of mains voltage. Galvanic isolation and voltage adjustment is enabled by three phase input transformer. The output filter reduces the output voltage ripple according to the requirements of sensitive loads and batteries. Cooling of the rectifier is derived by natural air flow, which by avoiding the fan, further increases its reliability and availability. The operation of the rectifier is controlled by the modern microprocessor control unit KONLOG. Thanks to the high-speed signal processing significant increase of the regulation and control reliability as well as many additional functions is achieved. Control takes place in real time and allows parameter setting, accurate diagnosis, local and remote insight into measurements and signaling. Communication with the station computer, dispatch center and specialized service center is possible. Rectifier KONIS-T 220 measures voltage, current and temperature of the connected battery and in accordance with them, the rectifier performs appropriate protection, control, test and signaling functions. It takes comprehensive care of the battery, ensuring that it is always charged, in good condition and ready to take over the supply of the connected loads. In addition to the perfect adjusted charging and float charging voltages, it offers the possibility of different modes of automatic charging and recharging, charge current limiting, checking the integrity of the battery circuit, indicating the battery status, checking the battery capacity, protecting from high or low charging voltage, protecting from deep discharge, signaling increased temperature etc. The rectifier further monitors the supply voltage of connected loads and signals a deviation from the declared limits. It especially monitors the insulation of plus and minus pole towards the earth and signals the occurrence of earth faults. It also detects the occurrence of a short circuit and activation of the circuit breaker.